Born 15 April 1919, Vincennes, Knox, Indiana, died 24 October 2009, Solon, Cuyahoga, Ohio. 1. Jane EBY married William Frederick GATES in Caserta, Italy on Sep 8, 1945. 2. Jane's father was Earl Hussey EBY, born 6 August 1886 in Indiana. 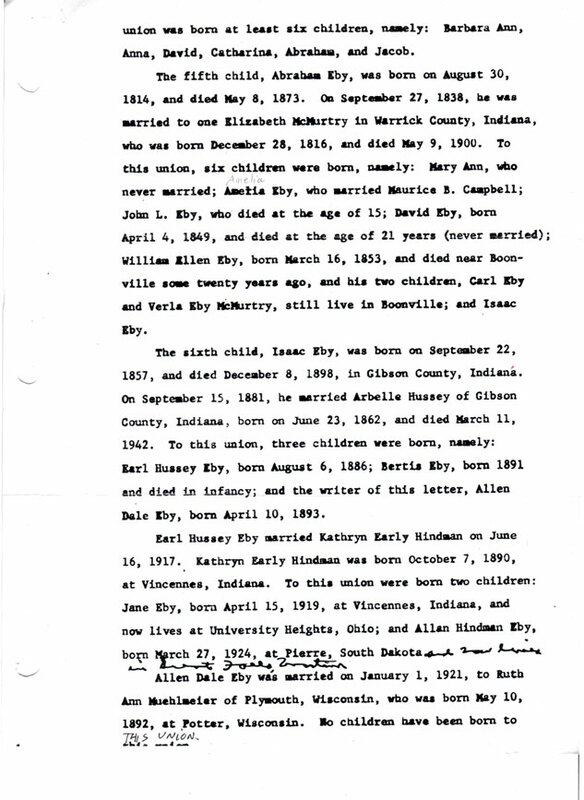 Jane's mother was Kathyrn Early HINDMAN, born 7 October 1890 in Vincinnes, Indiana. They were married 16 June, 1917 in Knox County, Indiana. 3.. Jane EBY had a younger brother, Allan Hindman EBY, born 27 Mar, 1924 in Pierre, South Dakota, listed on the 1930 Helena, Lewis & Clark Co, Montana census as "Jerry." The links take you to the federal censuses. To enlarge the image after you open it, use the plus-sign cursor and left-click with it on the image. Scroll down to find the family. Scroll right to read details. To download images to your computer for printing, right-click the linked image and then "save as." 4. Jane's father, Earl EBY, was listed, at the age of 23, as a surveyor, on the 1910 Valdez, Alaska census.Looking for oil perhaps? He was listed as a civil engineer in 1917 on his WWI registration and a civil engineer for the state of S. Dakota on the 1920 Brookings, Brookings County, South Dakota census. On the 1930 Helena, Montana census he is listed as a manager of a concrete pipe co.
5. 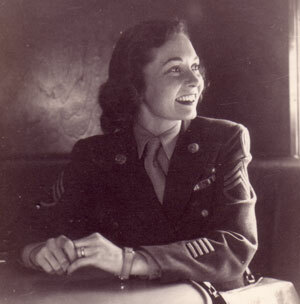 Jane enlisted in the military on 5 March 1943. She was in the Women's Army Corps, inactive reserve, as an aviation cadet. She was listed as 86" tall, 116 lbs, civil occupation: "clerks, general office," residing in San Francisco, CA. 6. Jane's maternal grandmother, Kathryn Early HINDMAN's mother, was Josephine GREEN, born Sept. 1855. On this 1900 Vincennes, Indiana census Kathryn E. is 9 years old, with older siblings Walter G., 12, Annie L. 14, Frances G., 17, Lucile A., 20. The HINDMAN family is listed in the 1880 and 1900 censuses as having one servant. Josephine and Josephine's father were born in KY but Josephine's mother was born in France! 7. 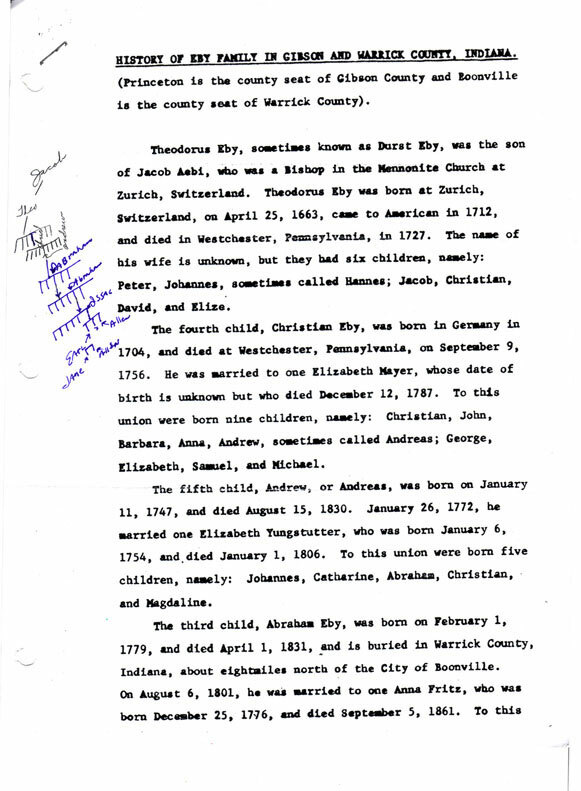 Kathryn Early HINDMAN's father was Walter M. HINDMAN, a Dds in 1900 in Vincennes, Indiana. Walter's father was James L.D. HINDMAN, born 1817 in Ohio. James L.D. HINDMAN was a doctor in 1850 living with wife, Sarah, four children and James' mother, Jane, in Unity, Ohio (1850 census Unity, Columbiana, Ohio). This original Jane, probably our Jane's namesake, was born in PA in about 1777 and is living alone, widowed, as early as1830 in Unity, Ohio. In 1830, ahe is age 53 and has two teenagers, probably the two youngest of a larger family: a male, age 10-15 (James L.D., age 15) and a female, age 15-20, probably her daughter. 8. 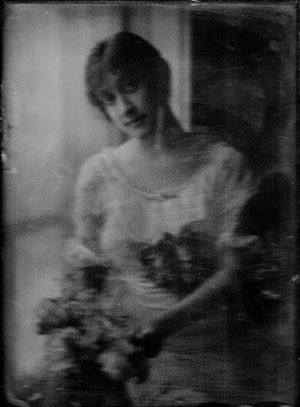 This is a photograph of Kathryn, courtesy of Rick Gates and Kenzie Gates Gabbard. Would this be Kathryn Early Hindman, Jane (Eby) Gates' mother? 9. Earl Hussey EBY's mother, Arabelle M. (Hussey) EBY was a widow at age 36 with 2 sons, Earl, 12 and Allen, 6 years old, working "keeping boarders." Likewise, Arabelle's mother, Sarah (Patterson) Hussey, was a widow at age 33, losing her husband to the Civil War in 1862, leaving her with 6 children ages 2-16 to run the farm in Patoka, Indiana. including all the descendants of Theodorus EBY, Jane's immigrant ancestor, from Switzerland. brother of Earl Eby, born 1893, who had no children. Courtesy of Sharon Gates, Ryn Gates and Jane (Eby) Gates. 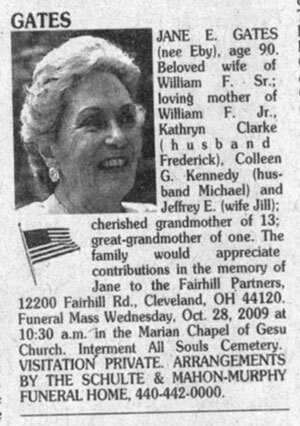 Jane (Eby) Gates died Oct. 24, 2009, in Solon, Ohio.